They're back! Actress Candice Bergen, who played the Murphy Brown, shared the first photo from the upcoming reboot of Murphy Brown — and we are getting serious flashbacks. 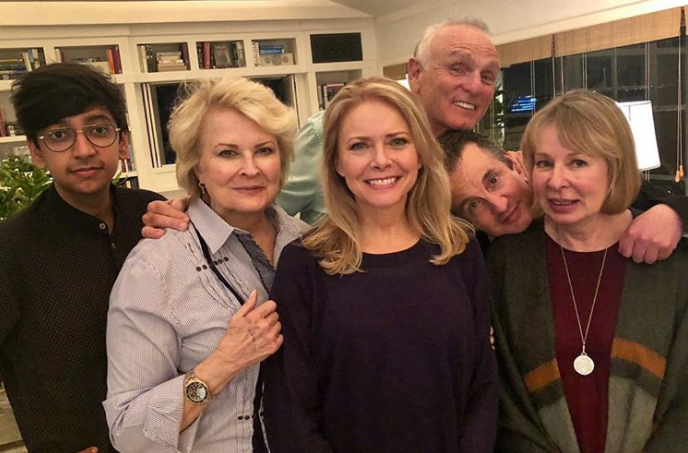 In the Instagram photo, Candice is joined by the old and new cast members, including Nik Dodani, Faith Ford, Joe Regalbuto, Grant Shaud, and creator Diane English. And get this: The crew will start filming new episodes this July in New York City! CBS announced that it would be airing 13 new episodes of Murphy Brown starting September 2018. The show, which aired for 10 seasons from November 1988 - May 1998, became one of the most beloved television shows — and the target of a heated political conversation. Commentary: We had first talked about this story back in January. With the success of the ROSEANNE relaunch, I am definitely looking forward to this. Murphy Brown was a great show, and I have been watching it in reruns, and it still stands up so well. In this era of fake news, I imagine Diane English has a lot to say. Nice to see Miles, Frank, and Corky returning to the show along with Murphy Brown herself. I know Charles Kimbrough has been retired from acting for the last 15 years or so, but I still hope we get to see Jim Dial in some capacity. I am just not sure the show would be the same without that great voice calling Murphy "Slugger." A few weeks ago, they had also announced that Jake McDorman (LIMITLESS) would be playing Murphy's son Avery. This show is shaping up great. Glad that we don't have to wait until mid-season, MURPHY BROWN will be airing a 13-episode season starting in September 2018.